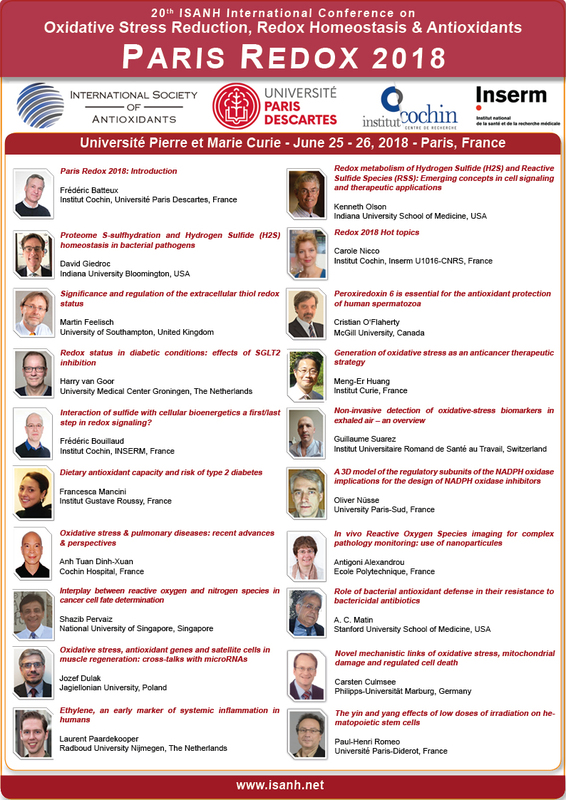 The Scientific Committee of Paris Redox 2019 will be welcoming Pro. Dr. Carsten Culmsee, from the Philipps-Universität Marburg, Germany. Prof. Dr. Carsten will be presenting his studies entitled "Metabolic switches saving mitochondria from oxidative stress". Summary of presentation: Mitochondria are the key organelles of energy metabolism and key regulators of the cellular redox balance, calcium homeostasis, and in signaling pathways of programmed cell death. Over the past years, we characterized mitochondria acting both as targets of death signaling triggered by increased reactive oxygen species (ROS) and as executioners of programmed cell death signaling in neurons. Here, we identified the ubiquitinase cylindromatosis (CYLD) as an intracellular sensor of enhanced ROS formation and upstream of RIP1/RIP3 necrosome formation in ferroptosis. Both, to RIP1 and CYLD gene silencing preserved mitochondrial integrity and function, and provided protective effects in cultured neurons and in models of cerebral ischemia and brain trauma. The underlying mechamisms of mitochondrial and cellular protection against ferroptosis involve metabolic switches from mitochondrial respiration to glycolysis. For more information about Paris Redox 2019: www.isanh.net. Myeloperoxidase, oxidative stress, and diseases: can we stop it ? Is NADPH oxidase activity regulated by free radicals? The registrations for ISANH Paris Redox World Congress 2019 are now open! Is There a Link Between Diabetes and Parkinson's Disease? Can Vitamins and Supplements Help Patients with Mitochondrial Disease?